It's a balmy 40 degrees and raining this morning. The weatherman is forecasting snow up to one inch in the higher elevations which is where we are. 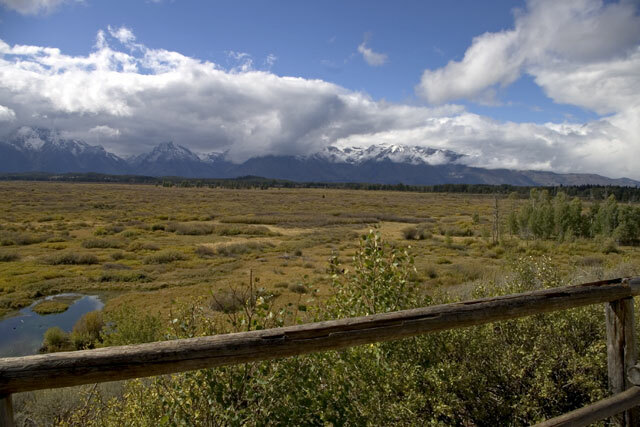 We will be heading south to Teton National Park today which is about 2,000 feet lower than Yellowstone. That should get us out of any snow potential. Sure enough before we could get ready to travel the snow started. They are big wet flakes and they are not sticking to the road yet. With rain gear on we emptied the tanks, put away the hose and power cord, lowered the jacks and hooked up the truck. The trip south was beautiful with the new snow on the pine trees. 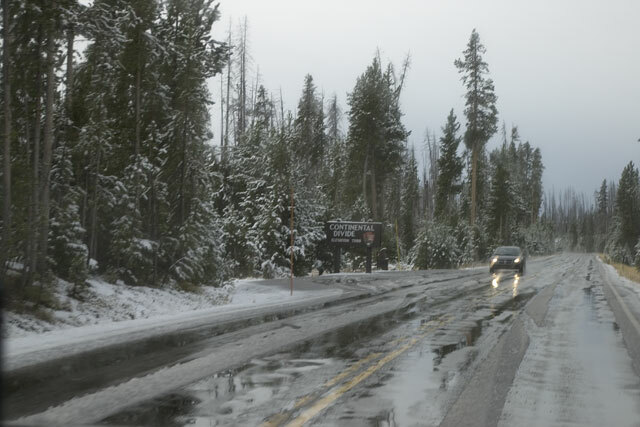 We got into a few areas where the snow was sticking to the road in the form of slush but we never felt out of control. The most snow we saw was as we passed over the Continental Divide. The fumerals along Lake Yellowstone were really steaming in the cold weather. One spot looked like a town with heavy industry belching out lots of smoke stack steam. The pull-out where we could have taken a picture of it looked pretty snowy so we kept going. 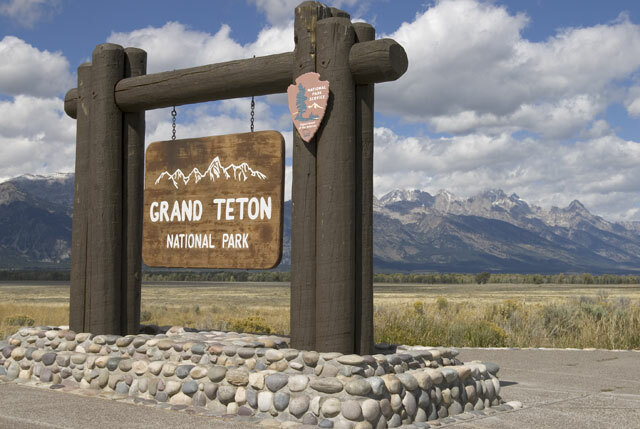 There is no gate going from Yellowstone National Forest into the Grand Teton National Forest. You just past a sign and that's it. No gate means no additional fee to get into the park. The cloud layer was just low enough that we didn't get to see much of the mountains on our way to Colter Bay RV Park where we plan to spend the night. 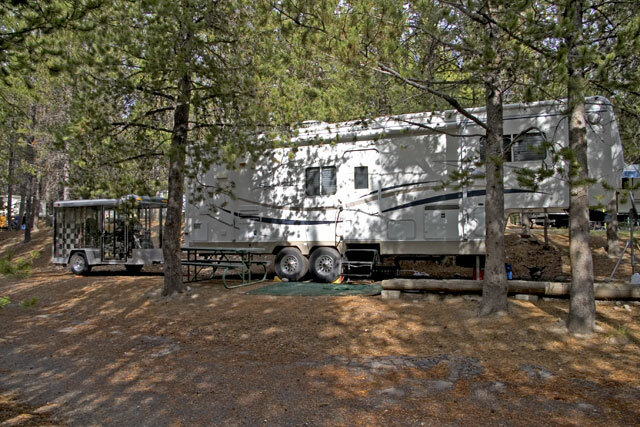 Colter Bay RV Park is in Colter Village just about sixteen miles into the park. 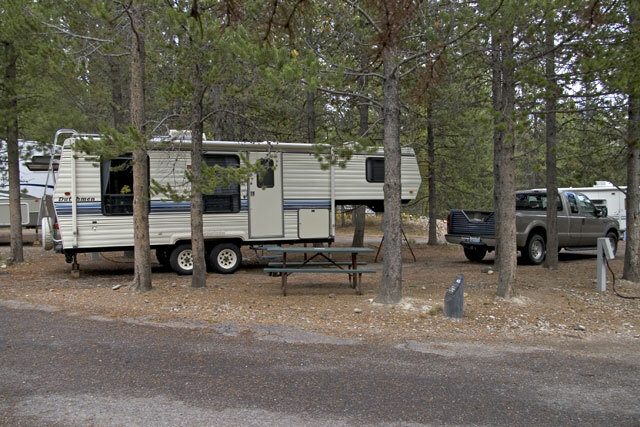 It's a lovely campground with full hook-ups and lots of trees. The trailers are spaces so that you really don't feel very crowded. Once camp was set up we ventured out to see what's around. We started with the Indian Museum in the information center. They have many artifacts from Indians all over the country. The displays are very nice but the descriptions of the artifacts are a little sparse. From there we headed to the Jackson Lodge, stopping along to way to take pictures of the Teton Mountains which were starting to peak through the clouds. We were hoping that the lodge was another one of the old elegant log lodges from the 1930's but it's a newer modern lodge made from concrete. 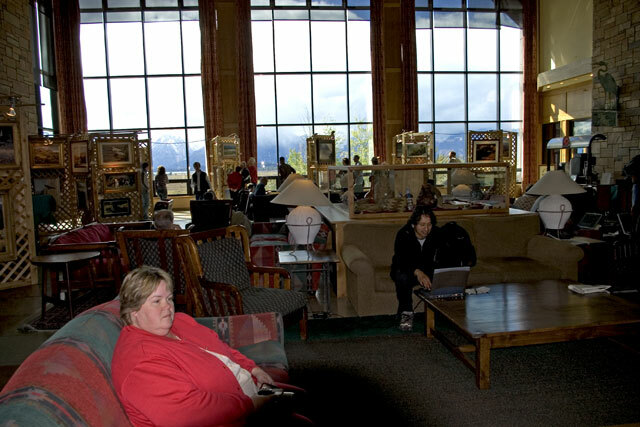 The great room inside is impressive with its huge windows looking out onto a large meadow and the Teton Mountains beyond. They have a very nice deck beyond the windows for just sitting and watching the mountains. There is some wildlife that shows up in the meadow but we didn't see any. After we sat and watched people for a little bit we headed back to camp for a quiet dinner and evening. 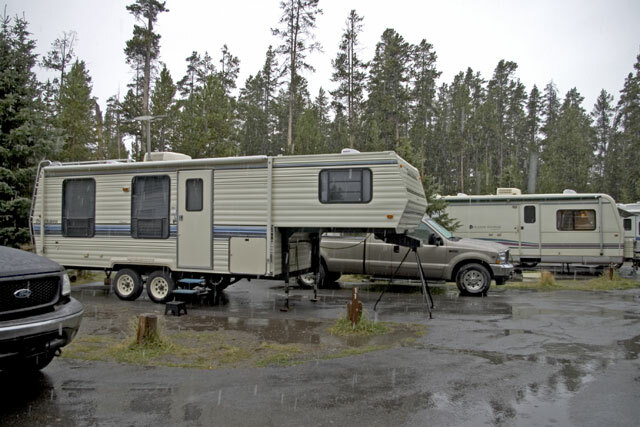 We took a walk around the park and it's always fun to see the different rigs that people have. We came across a really different trailer arrangement, this guy had a clear walled motorcycle trailer hooked on the back of his fifth wheel trailer. We didn't even know that something like that would be legal. Tomorrow we'll drive on down to Jackson Hole and do all the sights.